The Bjarni Jónsson Prize for Research is awarded each year to a graduate teaching assistant in the Department of Mathematics for exceptional research in mathematics, as well as for outstanding research potential. 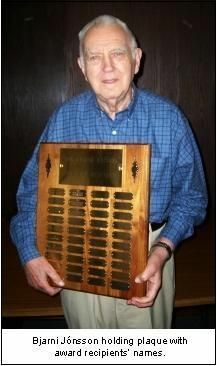 The Bjarni Jónsson Prize was established in honor of Bjarni Jónsson, Distinguished Professor of Mathematics, Emeritus, who taught at Vanderbilt from 1966 to 1992. Professor Jónsson came to Vanderbilt in 1966 as the University’s first Distinguished Professor. A native of Iceland, he earned his bachelor’s and doctoral degrees from the University of California at Berkeley. Jónsson’s area of specialization is lattice theory and universal algebra. Fourteen students earned their Ph.D.s under Jónsson’s direction, seven of them at Vanderbilt. He received Vanderbilt’s Harvie Branscomb Distinguished Professor Award in 1974 and the Earl Sutherland Prize in 1982.